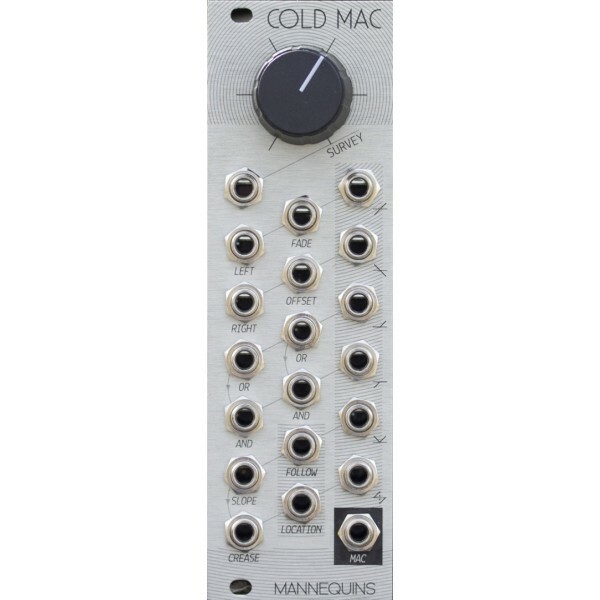 The Mannequins Cold Mac is the spice in your modular melange. Utilitarian functions strung together in a complex web of interaction. Survey your creations with meta-control or expand your sources in twisted mirrors. Quite simple-minded or intensely multitasking, Cold Mac will provide a new way to approach any given patch. At it's most basic, six audio inputs are mixed to Mac with linear voltage-controlled amplification of the mixture. A second simple VCA expands into crossfades or panning depending on ins and outs chosen, accepting a third input for an isolated building block. Logical comparisons provide alternative audio combinations or voltage controlled dissection of an input about a floating point. Applying control voltages here lends to intriguing modulations, while simple triggers beget rhythmic expansion. Integrated envelope following can analyse a source, or simply slew a pulse or CV - ideal for self-patching into SURVEY. FULL wave rectification, and a wildly aggressive CREASE function fold audio into new timbres, while LOCATION follows the trend of your modulation shifting in longfrom gestures. Patch surveillance is the key to Cold Mac's heart. Six function transfers and two time variants of SURVEY are at once available. When extensively linked, even small manipulations result in rapid and unfolding evolution. This meta-rule can be entirely self-referential, leading to the most unhinged cross-modulation. Between two Mangroves forms the gentlest kiss of impassioned creativity, but with Three Sisters becoming an indelible milieu.